The 3D viewer allows you to see the project from any perspective giving you a clear view of the finished product. 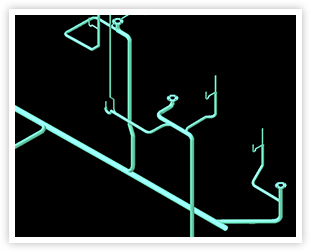 The three dimensional view shows a “real life” view of the pipes and plans that can be printed, saved and/or exported in any of several file formats. You can view your drawing from any angle by selecting any of several preset perspectives or by rotating it using the “orbit” tool. Your field personnel can see precisely how the project should look when complete which will save time and eliminate confusion. They say a picture is worth a thousand words and this is especially true in construction. You can create a pdf file from any screen view and save it to be emailed to any interested parties. You may also create graphics files in other formats such as bitmaps, jpegs, or tiffs although pfd files are becoming more and more popular as pfd viewers provide more functionality. 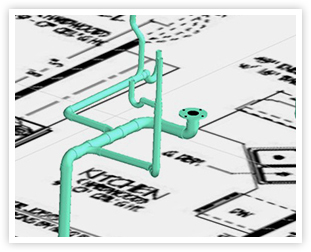 Instructors and students will find this feature to be an invaluable resource for explaining plumbing design methods and procedures. 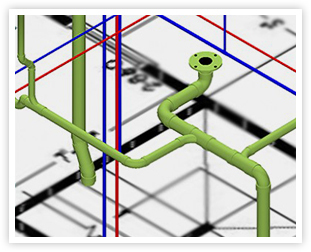 One of the greatest challenges of plumbing instruction is conveying a 3D project in a typical 2 dimensional medium. This problem is solved by the 3D viewer which you can set to rotate giving the student the ability to comprehend the entire project from all angles. They may also orient and view the plan from any perspective using the orbit tool on the toolbar.